Spider plant (Chlorophytum spp. ): growing, planting, caring. Scientific name : Chlorophytum spp. Chlorophytum - the spider plant - is a genus of almost 200 species of evergreen perennial flowering plants in the asparagus family, native to the tropical and subtropical regions of Africa, Australia, and Asia. They grow to 10–60 cm tall, with a rosette of long, slender leaves 15–75 cm long and 0.5–2 cm broad and thick, fleshy tuberous roots, small, usually white flowers produced on sparse panicles up to 120 cm long. 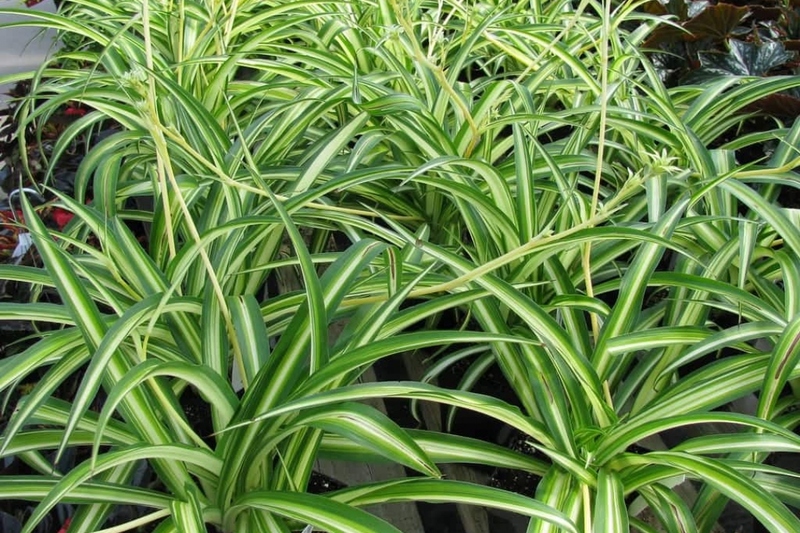 Among the 200 species is Chlorophytum comosum, the common Spider Plant, a native of South Africa and a very popular houseplant especially in its variegated form 'Vittatum'. The phalangera are exotic African perennials that form tufts of elongated basal leaves, most often linear or lanceolate. In summer, clusters or panicles of flowers, sometimes accompanied by seedlings, grow. Originally from Africa, phalangères are houseplants, as such they should be planted in pots in a mixture of soil and potting soil/ compost, preferably in April. Place them in bright, non-burning light, and you're done. Water twice a week during the vegetative period, and once every two weeks in winter, to keep the soil moist. The chlorophytum stores water in its roots, so it will support more easily the omissions of watering than the excessive watering. Empty the saucer a few minutes after each watering. Every 3 or 4 years, at the end of winter, transplant your peperomia carefully to a slightly larger pot than it's current, adding a mixture of fibrous compost and garden soil, maybe with an extra of slow fertilizer. For Chlorophytum comosum, it's very easy! In summer, collect seedlings from the stems and transplant them in a mixture of earth and compost. That's all! As soon as the temperatures drop, bring in your phalanx, in full light. You can put your phalangères out when temperatures exceed durably 10 ° C.